I spent the last week in Florida, and it was glorious! No where makes me happier than the beach, and no where feels more at home than my grandparents house. I moved a million times growing up and it was the one place I always visited. We were able to spend time with my Aunt, Uncle, and cousins as well. It has been years since I’ve had good talks with them. I definitely could not have asked for a better week! Thank you mommy for getting us all together! This past week we visited the Pickerts in Pensacola, FL. My grandparents live there and we rented a house at the beach that all the families could stay at. We probably had less relatives than we had before, but we also have more college graduates than we have before. Cousins have real jobs and commitments and no longer have a holiday break. I got my own room because of this. I have never had my own room. There is usually a room with twin beds or bunk beds to be shared. Michael wasn’t there, I like it when Michael IS there. Overall, it was a great little trip. There was lots of walks on the beach, a lot of bonding with relatives, and an exorbitant amount of eating. Everyone brought the sweets they had been gifted by neighbors and coworkers so there was an entire counter space designated for holiday treats. 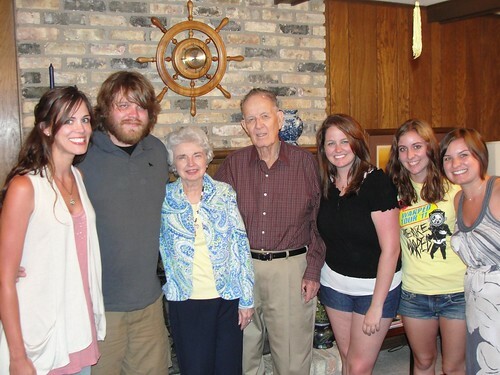 My grandparents thoroughly enjoyed having us all come to them, and that is what it was all about. On the last afternoon I realized I had not taken any pictures, so Emily, Reade, my mom and myself walked down to the beach. As a result I only have pictures of the four of us. Dad, Emily, Michael, Momma, and me. We may not be able to all look at the camera at once or manage to arrange ourselves nicely, but we are some good looking folks. 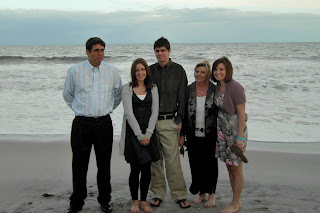 This picture was taken at my cousin Drew’s wedding in Myrtle Beach, SC last month. The beach and family are my favorite things; I wish I got more of both.